FlutterbyBooks: A Passionate Love Affair With A Total Stranger by Lucy Robinson. 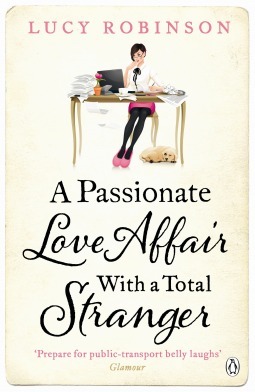 A Passionate Love Affair With A Total Stranger by Lucy Robinson. Chick-lit with a crazy concept. I had never heard of people ghost writing on dating websites and if it weren't for me watching an interview with Lucy Robinson I don't think I would have believed it was real. Scarily, this stuff actually happens out there in the cyber dating world. Let's be honest; I can't really relate to workaholic Charley, unlike her I really don't take my job too seriously, but she is a very likeable character. Her relationship with flatmate Sam, and her family was lovely to read. And I would really like a dog like their family dog. I can't say this was the best chick-lit book I've ever read, not that there's anything wrong with it, it just lacked that special something to make it stand out from the crowd. But it's a pleasant read non-the-less.